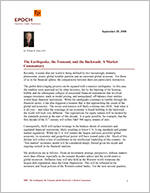 The Earthquake, the Tsunami, and the Backwash: A Market Commentary - Epoch Investment Partners, Inc. Recently, it seems that our world is being defined by two increasingly dramatic phenomena: erratic global weather patterns and an uncertain global economy. For those of us in the financial sphere, the comparisons between them are particularly instructive. The global deleveraging process can be equated with a massive earthquake. In this case, the rumbles were spawned not by plate tectonics, but by the bursting of the housing bubble and the subsequent collapse of associated financial instruments that involved opaque structures, mark to model pricing, and unregulated, off-balance sheet entities within large financial institutions. While the earthquake continues to rumble through the financial sector, it has also triggered a tsunami that is fast approaching the coasts of the global real economy. The waves and tremors will likely continue into 2010. And when it is all over – and when the wreckage of our economy is found bobbing in the backwash – the world will look very different. The expectations for equity returns will be modest by the standards present at the start of this decade. It is quite possible, for example, that the first decade of the 21st century will reflect S&P 500 equity returns of zero. Consequently, thrift will replace leverage in the balance sheets of consumers and regulated financial institutions, likely resulting in lower U.S. living standards and greater market regulation. While the U.S. will remain the largest and most powerful global economy, its economic and geopolitical power will have waned quite a bit. Much of this decline will reflect a loss of confidence in the intellectual leadership of this country. Its “free market” economic model will be considered deeply flawed given the recent and ongoing turmoil in the financial markets. A rotation in leadership from global cyclicals (e.g. materials, industrials, and energy) to defensive sectors (e.g. utilities and consumer staples). This rotation will reflect the woes of the broad economic slowdown, particularly those emanating from China. Since all prices are set on the margin and China has become the marginal consumer of almost everything from wheat to steel to oil, a slowdown there will have a dramatic impact on commodities and commodity related equities. Oil at $80 a barrel is not unthinkable. Rising pressure on corporate profits and cash flows will threaten future capex spending. Firms dependent on the capex plans of customers will have their expectations unfulfilled. A normal yield curve will prevail in the U.S. until the Fed feels the financial system has been secured. Until then, no rate rise will occur in the U.S. The dollar will rally, more by default than merit, reflecting rising growth risks outside the U.S. This will add to the headwinds facing energy and commodity prices in general. U.S equities will outperform those of other developed markets reflecting, in part, that U.S. equities are on sale if seen through the eyes of Canadian, British, or Euroland investors. Cross-border investments in U.S. assets and acquisitions of U.S. firms by non-U.S. entities should become more likely, particularly after our elections. The finance sector will start to recover at the inflection point where debt write-offs prove to be 50% of the ultimate total. If the IMF estimate of $950 billion is correct, we are already halfway there, having recognized $500 billion in write-offs to date. Should Bridgewater’s or Roubini’s estimates prove more accurate, $1.6 trillion and $2.0 trillion respectively, we will have to wait longer for financials, and the market as a whole, to hit bottom. Nevertheless, the bottom in financials may occur sooner than the bottom in the real economy, as the latter’s slide has just begun. We have a long way to go before the “all clear” bell starts to ring. Eventually, however, a stronger dollar combined with lower energy and commodity prices will reduce inflation concerns that in turn will make central banks more accommodating, spur real income growth for consumers, and aid margins for corporations assuming current wage rates remain under control. From a valuation perspective, global equity yields (earnings divided by price) have reached twenty year lows and are more than double bond yields. See Figure 1 below. Even allowing for a meaningful decline in earnings over the next year, earnings yields should remain well above bond yields. As an example, U.S. equities offer an earnings yield of over eight percent, while ten-year government bonds offer less than four percent. All told, we are still in the midst of two active crises in the global economy: the earthquake of deleveraging and the tsunami of international economic instability as the world deleverages. This will be the time to build portfolios comprised of companies that reflect our firm’s trademark investment criteria: free cash flow, little or no debt relative to peers, transparent business models, management teams that can execute, and of course, “reasonable valuations,” something that, despite the ongoing turmoil, the market is sure to deliver in the upcoming period.